Here is a Sample Gantt Chart Google Sheets Template Format. You can download, save and use the below link to quickly create simple Gantt chart using Google sheets. This Example Gantt Chart Google Sheets Template helps you to make a copy of the template and create new Gantt Chart using Google Spreadsheets. This template is created using Online Google Sheets, free Spreadsheet application from Google. Here is the preview of the Google Sheet for Gantt Chart. You can have look and and download the file in xlsx format. 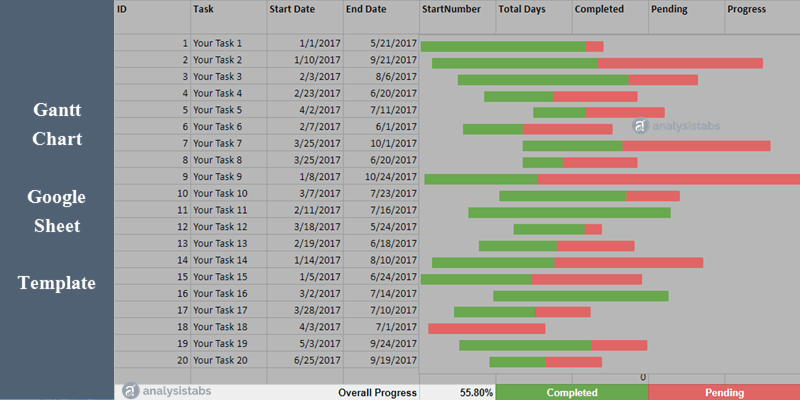 The Format the Chart with Required Colors to indicate % Completion and Due. We need to create the Sample data for creating the Gantt Chart in Google spreadsheet. Follow the below steps to prepare example data. Now, let’s create the Chart for the data prepared in the above step. Thanks you very much. Simple and very useful.